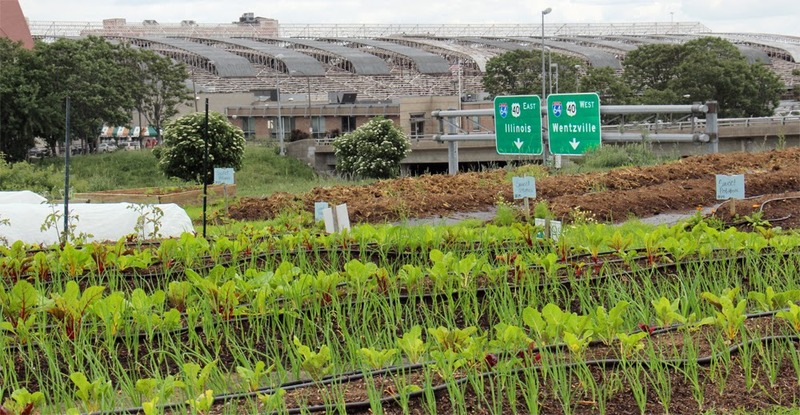 In a city, feeding ourselves may be tangential to larger reasons for growing food. Some folks set up community gardens as charitable enterprises, intending to donate food to local food banks or hot-meal programs. City schools often start up vegetable plots to teach students where there food comes from, how to grow it, and how to care for the earth. Some forward thinking hospitals have started growing their own food to provide healthy fare for their patients. Some grow a garden to create an oasis for wildlife or to reduce the city heat island effect. I would bet that there is a police department somewhere running a neighborhood farm to keep inner-city youth occupied and off the streets. If there isn't, urban police departments take note - it may be time to start a farm. I find it inspirational - all the uses people have found for gardening in a city. However, I have come to the city to explore urban farming, and not urban gardening. In my mind, there is a difference. A farm produces food for sale to the public, feeding many people. It also provides a livable wage for the farmers involved. On top of that, I am looking into those farms engaged in sustainable food production - farms that leave the earth better than when they started, use few outside resources, have a low transportation footprint, and do no harm to those who eat and produce the resulting food. So, I was hesitant, when I heard about a local non-profit, Gateway Greening. Their goal is to "educate and engage communities through a unique mix of garden and urban agriculture initiatives." Notice this goal includes no mention of food, no mention of wages or profit, and no mention of sustainability. But at some point in the past, they had helped New Roots Urban Farm when it was getting started. As it turns out, they also run a farm - City Seeds Urban Farm. I spoke with Annie Mayrose about City Seeds Urban Farm. It is a 2.5-acre vegetable farm near Union Station in downtown St. Louis. I could see St. Louis' most prominent monument, Gateway Arch, from the farm. I could also see interstate highway signs and city buildings just beyond the crops. Annie told me that last year, the farm produced about 14,000 pounds of produce. Half of it was sold at wholesale prices to Food Outreach, a local non-profit that provides nutritional support to those with cancer or HIV/AIDS. I am hoping that nutritional support is non-profit-ese for food. A good chunk of the produce was sold at retail outlets; any revenue is plowed back into the farm. They also shared their food with local soup kitchens, Emmanuel Adventist Food Pantry, and Operation Food Search. Food that was not good enough for sales and distribution is available to those who grew it. Annie went into some detail about how City Seeds farms. They prevent disease by providing optimal growing conditions. They make use of companion planting, intercropping, and the release of beneficial insects, when necessary. They make some of their own compost on-site. They have a dwarf fruit tree orchard to save space. They have a rainwater cistern to supply some of their water. They use a drip irrigation system to conserve water. Even though they are in the heart of the city, their biggest problem is ... rabbits. Trapping and relocating did not solve the rabbit problem, so they put up a hawk platform to attract rabbit predators. Good thinking. I'm not sure that the scarecrow complements the hawk platform. This sent me to the internet, wondering if other farmers are successful using hawk platforms. The first entry turned up by my search was unrelated, but the second entry brought me to the website for Foundation For Rabbit-Free Australia. A whole continent is looking to rid itself of rabbits. Evidently this is a far larger problem than I knew. City Seeds Urban Farm certainly sounds like a farm. However, the primary focus of the farm does not lie in feeding the community. Rather, in collaboration with St. Patrick Center and others, they serve veterans and those overcoming homelessness, mental illness, chronic addiction and/or prison release. One City Seeds program teaches clients how to grow food - a form of therapeutic horticulture. Another City Seeds program provides job training in landscaping and horticulture. As a non-profit that has accountability to its funders, they keep statistics. Graduates of this second program have an 82% job placement rate. Since they began growing food in 2006, about 450 people have participated in these two programs. None of these folks are paid wages; they are actually clients. As it turns out, City Seeds is only a portion of Gateway Greening's work. Their Community Gardens Program has helped start and support more than 200 community gardens in the St. Louis area. Their Youth Program supports 75 school and youth-focused gardens. They have a demonstration garden and lead many workshops. In 2012, they tracked over 13,000 volunteer hours donated to their programs. When viewed from a community services and community development perspective, Gateway Greening has had a huge, positive impact. 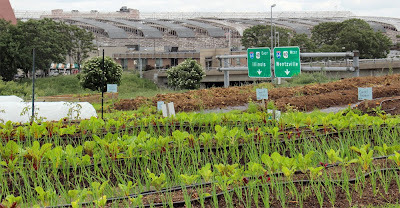 Kudos to them for adding sustainable agriculture to the mix. So where does one draw the line between a garden and a farm? Between a not-for-profit farm and a for-profit farm? Between a restaurant's herb garden and an herb farm? When I enter the city, these lines blur. I would argue that they are also relatively unimportant. More important is how we are going to expand agriculture over the next fifty years in order to feed a mushrooming population. How will we feed a growing population in the face of climate change? And how will we feed people who are more and more likely to live in urban environments? The fact of the matter is that all types of sustainable food production can help, whether they are in a private backyard, in a community space, behind a bedroom window, or on the rooftop of a restaurant. It doesn't matter what we call it. The natural world in which we grow food is a complex one. Within such complexity, we must take an adaptive, experimental approach to determine what will work best. I am thankful that we have so many types of farmers and farming today - so many, that they defy categorization. This may help us find the approaches that will best serve us in the future. A postscript for those of you who aren't put off by number-crunching and who are wondering why it takes me so long to write an article. First off, I am a deliberative writer. Second, I get side-tracked by small details that are of potential importance. For example, when I entered the Gateway Greening office, I was blown away by the number of employees present. I thought I saw at least six people working there and they did not appear to be volunteers. In case you are curious, I WAS wearing my volunteer-detection eyeglasses. One of the first questions out of my mouth was about their annual budget. It was huge. And, according to Mike Sorth, the Executive Director, Gateway Greening is not government funded. Annie Mayrose told me there are actually fourteen employees, but would not tell me who their largest funders were. I put all this on the back-burner, since it was not the subject of this article. However, when I later reviewed the Gateway Greening website, I found their 2012 Annual Report and their 2012 federal income tax form for 501(c) non-profits, the 990. Such transparency gives me much greater confidence in any organization. Then my natural curiosity about somebody else's tax return kicked in. And, more importantly, I was hoping to find some details about their donors. Line 8 of Form 990 listed their revenue from contributions and grants as $1,264,672. That's a lot of money. Under Expenses on Line 15, I saw "Salaries, other compensation, employee benefits (Part IX, column (A), lines 5-10)". The total was $81,624. How could Gateway Greening possibly pay its fourteen employees so little? What were their major expenses, if not employee salaries? I continued down the remaining 32 pages of related tax forms. Form 8941, "Credit for Small Employer Health Insurance Premiums" showed that they paid $16,104 for employee health insurance premiums. That would leave even less for employee salaries. I noticed that all of the Directors worked 0 hours per week, except for Michael Sorth, who is listed as a Director working 40 hours/week. The rest of the Directors better get working! Michael Sorth's compensation is listed there as well, which felt like a violation of his privacy, but there it was. If I added his salary and the health insurance premiums, there was only about $400 left for employee salaries. I know that 13 people are not being paid a total of $400 for their entire year's work. So, what up with that? I finally came to Part IX, where all would be revealed concerning employee salaries. Amazingly, Lines 4-9 showed $0 for employee salaries and Line 10 showed $45,409 for employee benefits. The bulk of the expenses showed up under Line 24 "Other Expenses". Underneath "Other Expenses", there were five lines, two for COMMON PAYMASTER and one for "All other Expenses SEE SCH O". Those three lines come to $572,973. Now that sounds more like employee compensation numbers to me. A balance sheet is included in these tax forms, but I zoomed through, hoping to avoid another batch of details that might need investigating. Then I went straight to Schedule O, seeking enlightenment. And there it was on page 32, "GENERAL NOTE- EMPLOYEES ARE LEASED EMPLOYEES AND STATUTORY EMPLOYEES OF SIMPLOY, INC., AN UNAFFILIATED ORGANIZATION." My appreciation goes out to Gateway Greening's tax accountant for including that little note in Schedule O. Although I had never heard of such an organization, Simploy is a professional employer organization. They take care of human resource activities, such as payroll, health and retirement benefits, workers' compensation, employment taxes and the like. A company that hires Simploy can then spend their time on the day-to-day supervision of these employees. Simploy lets small organizations take advantages of larger economies of scale in human resources. At least that's what Simploy leads me to believe. Nothing going on here. But a time consuming diversion none-the-less. Form 990 did not lead me to the identity of Gateway Greening's major donors. Perhaps it is Monsanto, with their headquarters in St. Louis. What an irony it would be, if this were the form of Monsanto's community service. I moved on to the 2012 Annual Report. It shows revenue from government grants totaling $116,585. Didn't Michael Sorth say that Gateway Greening did not receive any government funding? Perhaps that is only true for 2014. Or maybe, he is making a distinction that I misunderstood. No, no, no. No more investigating.